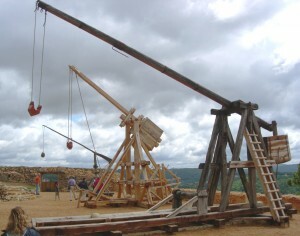 In this lesson students will design a working trebuchet for maximum accuracy, distance and force using the engineering design process. Students will utilize the measurement formulas to calculate kinetic and potential energy and therefore create a trebuchet for a specific function (ex. Hitting a target, knocking down a wall or launching for distance). Browse the Stem Curriculum archive. Grade Level: 6. Content Area: Expressions and Equations, Geometry and Spatial Sense, Order and Organization. Industry: Power and Propulsion. Bookmark the permalink.